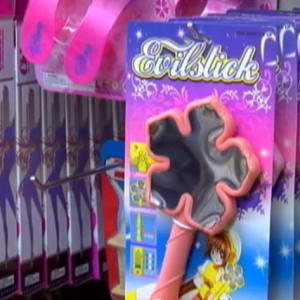 DAYTON, Ohio — A mother in Ohio is expressing horror after discovering that what appeared to be a pink princess wand that she purchased for her toddler at a local dollar store included a hidden photo of a girl slashing her arm with a knife. But after Allen purchased the item for her toddler daughter, and removed the foil that covered the end of the wand, she was shocked to find a photograph of a girl cutting her arm with a knife inside. Additionally, the wand didn’t play music, but rather featured a maniacal, evil laugh. Local reporters talked to the dollar store owner about the matter, who said that parents need to be more careful about that toys that they purchase for their children. “The name on it says Evilstick. So, in one way, if I am buying it for my kid–and I have lot of children and I have young ones—I would inspect it before I ever give it to them,” owner Amar Moustafa stated. But he said that while the toy may not be suitable for toddlers, it may not be completely inappropriate for older children. “For a five, six, seven, ten-year-old—they see that on TV every day,” Moustafa stated. He said that he will not remove the item from the shelf at this time unless he receives a direct complaint from a parent. It is not known whether other all Evilsticks have the same photograph inside, or if Allen’s purchase was a factory prank. Public feedback about the incident has been mixed. “[T]he store manager probably didn’t know about it, so it wasn’t his fault, but after he found out about it he should have taken it off the shelf because that toy isn’t suitable for any age child,” another named Samantha opined. “The store owner has a right to sell what they want, but in the end this toy is very misleading, and I believe it’s on purpose,” said a commenter named Brandi.